Sesamoiditis is a cause of pain to the bottom of the first metatarsal phalangeal joint that involves the two sesamoid bones and the surrounding soft tissues. The sesamoid bones are located on the bottom of the first metatarsal head in the forefoot and serve as attachment sites for the small internal muscles of the foot. Both the medial sesamoid located on the inside and the lateral sesamoid located on the outside of the foot are oval in shape and about the size of a lima bean. The sesamoid bones, small muscular attachments, and the ligamentous tissues of this region help form the bottom portion of the joint capsule for the first metatarsal phalangeal joint. The sesamoid apparatus helps to maintain the first digit on the ground and helps provide propulsive strength of the first digit during walking. During walking there are primarily two contact areas including the heel and the ball of the foot. The ball of the foot, termed the forefoot, has five metatarsal bones from the first metatarsal including the sesamoid complex through the fifth metatarsal bones. Each of these five contact points in the forefoot generally should disperse the pressures associated with walking evenly over the surface area of contact. Abnormal pressure to the region of the first metatarsalphalangeal joint caused by abnormal foot motion called pronation and repetitive stresses from walking, athletic activity or high heel shoes may cause inflammation to the sesamoid complex. Sesamoiditis is characterized by pain with direct pressure or movement on the bottom of the first metatarsal phalangeal joint. The pain generally starts slowly and can become very intense during walking activity. 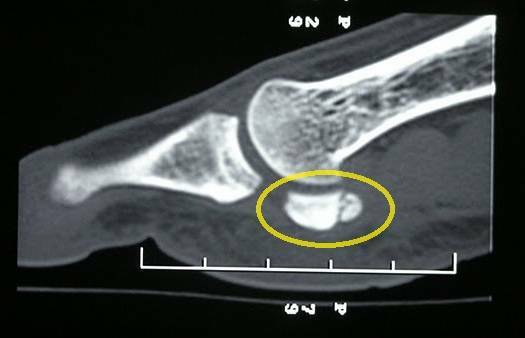 Swelling of the joint can occur but is not a characteristic feature. Sometimes both of the sesamoid bones can become painful but generally either the medial or lateral sesamoid is involved individually. Swelling of the joint heightens the concern for stress fracture to one or both of the sesamoid bones. Sesamoiditis is treated with reduction of weight bearing pressure to the painful region, the use of anti-inflammatory medications, and activity modification. Generally, the use of padding attached directly to the foot or to the liner of the shoe will reduce pressures during walking, enabling healing. A commercially purchased orthotic with pressure relief padding can be used with greater benefit in pressure reduction. If the pain is significant, a post-surgical shoe or removable CAM boot can be used until the pain has been relieved. Whatever method of pressure reduction is chosen, it is essential that you use this tool for all weight bearing activity. For many soft tissue problems including sesamoiditis it is invaluable to treat as if a fracture was present. A fracture for instance, needs to be immobilized in a cast for a specific period of time to allow bone healing. Soft tissue injuries also need rest for adequate recovery. If the sesamoiditis appears secondary to abnormal foot pronation a custom orthotic may be indicated to help with treatment and avoid recurrence. Anti-inflammatory medications like Ibuprofen or Naproxen can be used as directed by your physician to help relieve the pain and inflammation. A cortisone injection can be introduced into the first metatarsal phalangeal joint if the diagnosis of stress fracture has been eliminated. Ice massage to the region of pain twice daily for 10-15 minutes will also help relieve inflammation. These treatments decrease tissue inflammation thereby relieving pain. Activity modification rather than limitation is the key to maintaining fitness. It is essential if you are involved in load bearing exercise programs like walking or running that you temporarily choose low impact activities like swimming and biking. Sesamoiditis, if untreated, can progress to a stress fracture. The pain associated with that of a stress fracture is oftentimes indistinguishable from sesamoiditis alone. Swelling is oftentimes a characteristic clinical feature of a stress fracture and is not typically seen with sesamoiditis. X-rays can help identify if a stress fracture has occurred in either the tibial or fibular sesamoid bone. If a fracture is identified radiographically there is usually a sharply demarcated fracture line occurring through the body of the involved bone. It is always important that the treating physician take x-rays of both feet to rule out a bipartite sesamoid bone. A bipartite sesamoid is a sesamoid that is congenitally split into two distinct bones. Its borders tend to be smoother and less distinct that what is seen in a fracture. An MRI is the diagnostic study of choice, if the fracture line can not identified or if a bipartite sesamoid may be present. MRI shows swelling changes within the injured and provides great specificity leading to the fracture diagnosis.CT scans which show very good anatomic bone detail may be used in circumstances where chronic sesamoid pain has been encountered and surgical planning is being considered. Stress fracture treatment is impaired by a relatively poor blood supply to the sesamoid bones and the difficulty in reducing motion and pressure in this region. Also, impairing healing of these fractures is the delay in diagnosis that occurs between patients presenting to treating physicians and the differentiation between sesamoiditis and stress fracture. Due to the relatively high rate of delayed or non-healing of these fractures initial treatment of non weight bearing with the use of crutches for four up to eight weeks is usually indicated. Other forms of immobilization including Spica splints or CAM boots until clinical healing has occurred. The use of a custom orthotic may be required after stress fracture recovery to prevent future re-injury. If pain continues at the fracture site despite conservative care measures surgical excision may be required. The first metatarsal phalangeal joint and sesamoid apparatus can function well with one sesamoid bone removed. Removing the medial sesamoid bone however can lead to instability of the joint potentially leading to the development of a bunion deformity. The sesamoid bones are located on the bottom of the first metatarsal head in the forefoot and serve as attachment sites for the small internal muscles of the foot. Both the medial sesamoid located on the inside and the lateral sesamoid located on the outside of the foot are oval in shape and about the size of a lima bean. (PICTURE OF SESAMOID XRAYS WITH PHOTOSHOP) The sesamoid bones, small muscular attachments, and the ligamentous tissues of this region help form the bottom portion of the joint capsule for the first metatarsal phalangeal joint. The sesamoid apparatus helps to maintain the first digit on the ground and helps provide propulsive (picture of the propulsive phase)strength of the first digit during walking. During walking there are primarily two contact areas including the heel and the ball of the foot. The ball of the foot, termed the forefoot, has five metatarsal bones from the first metatarsal including the sesamoid complex through the fifth metatarsal bones. Each of these five contact points in the forefoot generally should disperse the pressures associated with walking evenly over the surface area of contact. Abnormal pressure to the region of the first metatarsalphalangeal joint caused by abnormal foot motion called pronation (link to pronation http://www.sanluispodiatrygroup.com/?page=patient_education&category=00008&article=00014 )and repetitive stresses from walking, athletic activity or high heel shoes may cause inflammation to the sesamoid complex. Sesamoiditis is characterized by pain with direct pressure or movement on the bottom of the first metatarsal phalangeal joint. The pain generally starts slowly and can become very intense during walking activity. Swelling of the joint can occur but is not a characteristic feature. Sometimes both of the sesamoid bones can become painful but generally either the medial or lateral sesamoid is involved individually. Swelling of the joint heightens the concern for stress fracture to one or both of the sesamoid bones. Generally, the use of padding attached directly to the foot or to the liner of the shoe will reduce pressures during walking, enabling healing. ( link: to product 378 at bottom)A commercially purchased orthotic with pressure relief padding can be used with greater benefit in pressure reduction. ( link to 10000 and 376)If the pain is significant, a post-surgical shoe or removable CAM boot can be used until the pain has been relieved. Whatever method of pressure reduction is chosen, it is essential that you use this tool for all weight bearing activity. For many soft tissue problems including sesamoiditis it is invaluable to treat as if a fracture was present. A fracture for instance, needs to be immobilized in a cast for a specific period of time to allow bone healing. Soft tissue injuries also need rest for adequate recovery. If the sesamoiditis appears secondary to abnormal foot pronation ( link) a custom orthotic may be indicated to help with treatment and avoid recurrence. Anti-inflammatory medications like Ibuprofen (http://www.drugs.com/ibuprofen.html) or Naproxen (link to : http://www.drugs.com/naproxen.html )can be used as directed by your physician to help relieve the pain and inflammation. A cortisone injection can be introduced into the first metatarsal phalangeal joint if the diagnosis of stress fracture has been eliminated. Ice massage to the region of pain twice daily for 10-15 minutes will also help relieve inflammation. These treatments decrease tissue inflammation thereby relieving pain. Stress fracture treatment is impaired by a relatively poor blood supply to the sesamoid bones and the difficulty in reducing motion and pressure in this region. Also, impairing healing of these fractures is the delay in diagnosis that occurs between patients presenting to treating physicians and the differentiation between sesamoiditis and stress fracture. Due to the relatively high rate of delayed or non-healing of these fractures initial treatment of non weight bearing with the use of crutches for four up to eight weeks is usually indicated. Other forms of immobilization including Spica splints (http://en.wikipedia.org/wiki/Spica_splint ) or CAM boots until clinical healing has occurred. Management of a delayed-union sesamoid fracture in a dancer. Return to activity after sesamoidectomy in athletically active individuals. Powerstep Full-Length features a prescription-like arch support encased in a unique double-layer cushioned insole (orthotic), plus a contoured stabilizing heel cup.